The NUT-R® Bicycle Axle Camera Mount™ was born from a general dissatisfaction with the number of mounting locations available for Action Cameras on bicycles. Our quest was to not only provide an innovative new Camera Mount in what is currently a technically stagnant market, but to also go one step further and create a professional Mount that best shows the raw fast-paced action that us riders live for. We believe that the footage recorded using the Bicycle Axle Camera Mount™ is much more exhilarating than footage recorded from conventionally mounted Action Cameras. 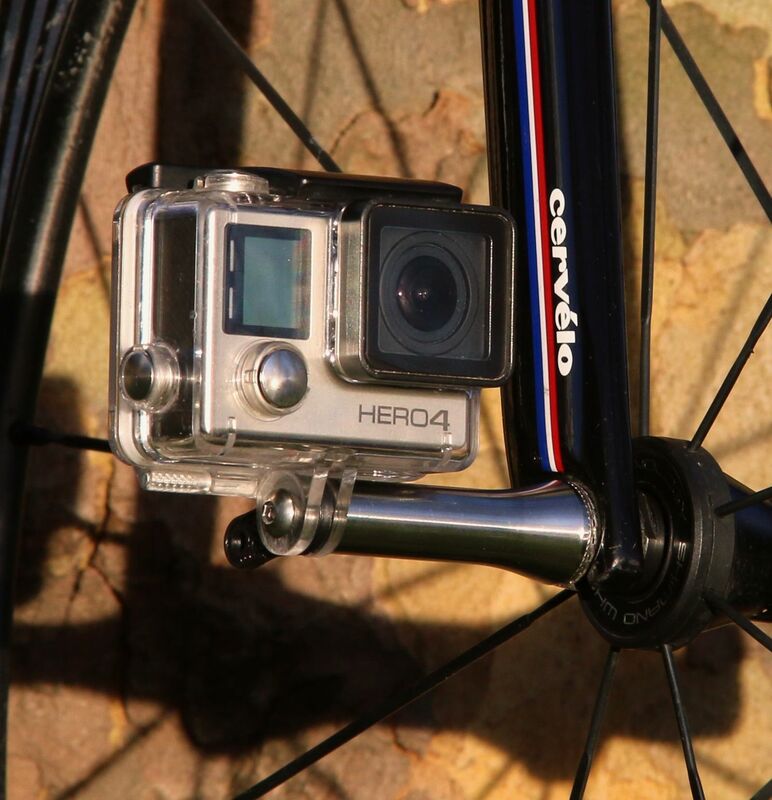 The Camera Mount replaces the Axle Nut of a conventional Quick Release Skewer system allowing the Action Camera (a full list of compatible Cameras are detailed below) to be positioned much closer to the ground compared to Handlebar or Seat post Camera Mounts. This change of viewpoint boosts the intensity of footage and provides a unique and thrilling viewpoint for riders to record their rides. The onboard footage also benefits from the Mount's extreme stiffness and its unique GoPro Side-Mount™ Camera interface which combine to make near vibration free footage. Even though the Camera Mount's main purpose is to attach an Action Camera to your Bicycle Wheel's axle, we haven't forgotten the importance of its wheel retention ability. The task of replacing a key component of a Wheel's Quick Release Assembly (which is potentially the most important component on a Bicycle when it comes to safety) was not taken lightly. Great emphasis has been made to test and qualify the Mount to ensure it provides the utmost safety and long-term reliability. In addition to the Mount passing industry standard qualification testing, each Mount also gets inspected and mechanically tested prior to shipping. So whether you intend to use the Mount on your beat-up commuter bike or on your "bling'd-out" race machine, have confidence that no corners have been cut in making this Mount. 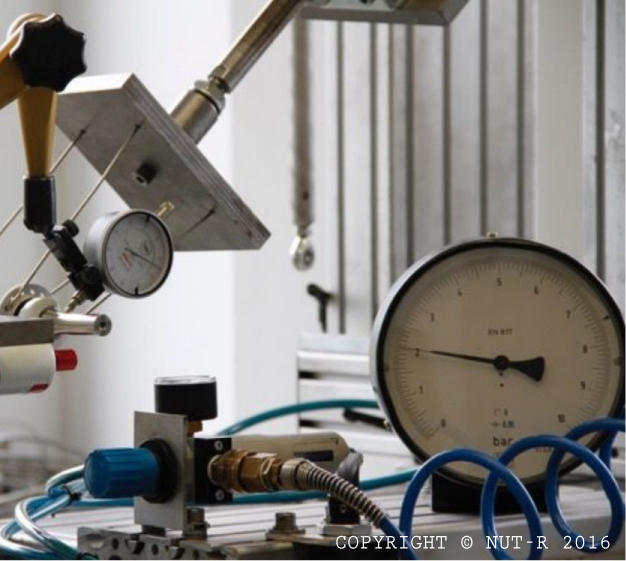 At NUT-R®, we aim to create products that continuously perform to the highest standard. This section gives a brief specification of the Camera Mount, for more information please scroll down to the relevant section. + other cameras that use the GoPro mounting system. What is included: 1 x Mount Assembly with Stainless Steel Hex Screw and Assembly/Safety Instructions. The new exhilarating perspective offered by the NUT-R® Camera Mount is unlike potentially any other consumer offered Camera Mount. It was initially inspired by the low-mounted on-board cameras fitted to the side fairings of MotoGP® motorbikes, allowing viewers to get even closer to the action and enhancing what is an already exhilarating sport. 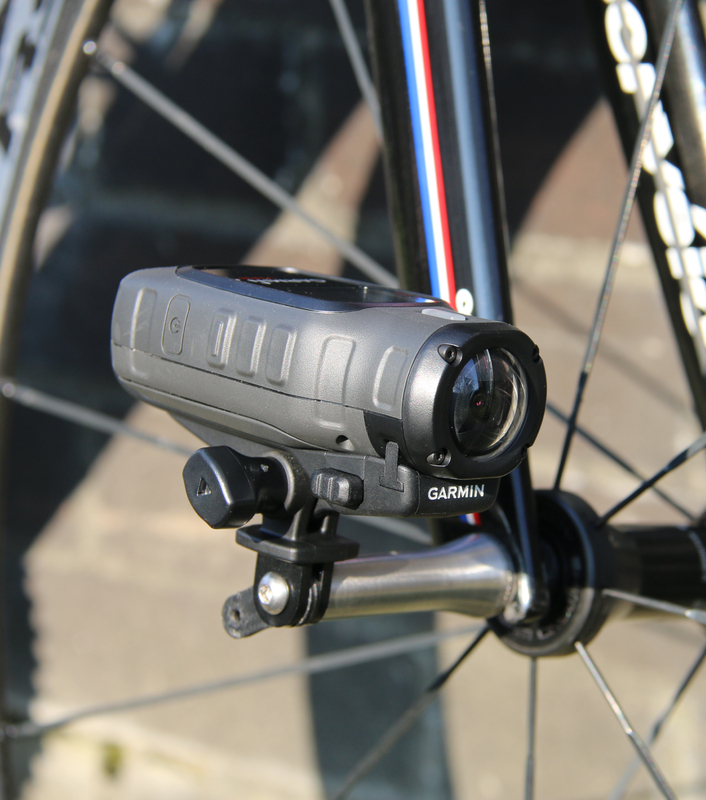 The low mounting point of the Camera on the bicycle creates a greater feeling of speed compared to HandleBar or Seatpost Mounts and we believe this more accurately represents the intense and fast-paced action possible in cycling. The NUT-R® Camera Mount can be fitted to either the front or back wheel and is specifically sized to offset the view of the wheel so that it does not overpower and block the direct forward vision. Deep sectioned wheels can also be used without detracting from the spectacle. The wide angle lenses on modern Action Cameras means that even though the Camera is mounted low to the ground, they are still capable of recording all of the action. Even if your front wheel is within millimetres of another rider's rear wheel, Cameras can still record the riders full body. The Mount is compatible with the standard GoPro Screw interface and can be used with the following Cameras:. Other cameras that use the GoPro mounting system. Action Cameras that do not have the GoPro mounting system can be used with adaptors. We do not currently manufacture these adaptors, however, we have have gone to the effort of finding externally sourced adaptors that may fit your Camera. We cannot guarantee fitment but we hope to verify these in the future. The NUT-R® Mount is compatible with standard Quick Release axle systems found on most road and mountain bikes. The mount fits the M5x0.8 Threaded Axle and replaces the existing Nut. Please note that this mount is not currently compatible with new "through axle" technology common in high-end mountain/cross bikes OR the old school hex nuts fitted to fixed/single speed bikes.These Mount designs are currently under testing. No matter how good your Action Camera is, if it is subject to excessive vibration, the footage quality will suffer. 1. High frequency, low amplitude vibrations; found whilst travelling over small but tightly packed road surface imperfections. 2. Low frequency, high amplitude vibrations; found whilst travelling over large potholes or up/down kerbs. From experiments, we found that the best method of reducing vibration was NOT introducing dampers between the camera and the mount but rather, joining the two together to make the STIFFEST possible connection. To eliminate as much vibration as possible, the goal was to make the connection between the Camera and Bike as stiff as possible. The decision to use Stainless Steel for the Mount Body (later discussed in the Material's section below) provided a very stiff foundation as Stainless Steel is 2.8 times stiffer than an Aluminium Mount of comparable geometry. 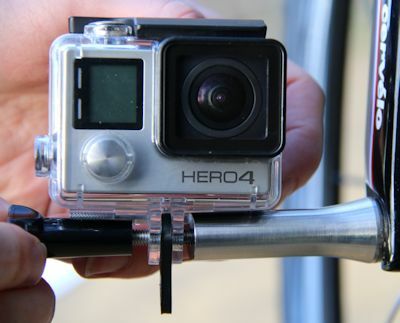 The other notable stiffness improvement came from a complete re-design of the standard GoPro® Camera mounting method. The Mount utilises a revolutionary GoPro® Side-Mount™ camera interface that provides a direct preload path to retain the camera and also retains the user friendliness of the standard GoPro® interface. So what do we mean by "direct preload path"? This means that a greater percentage of the torque applied to the retaining screw ends up preloading the connection, making it less prone to vibration. The stiffness of the Camera Mount ended up being so great that even when the camera was attached to the front wheel, not only were rear gear changes and braking audible but even the hubs free-wheel ratchet could actually be heard during playback. The GoPro® Side-Mount™ interface also reduces the distance between the centre of the axle and the Camera's centre of gravity and allows the Camera to be mounted at any angle (through a full 360 degrees) without the requirement for disassembly. 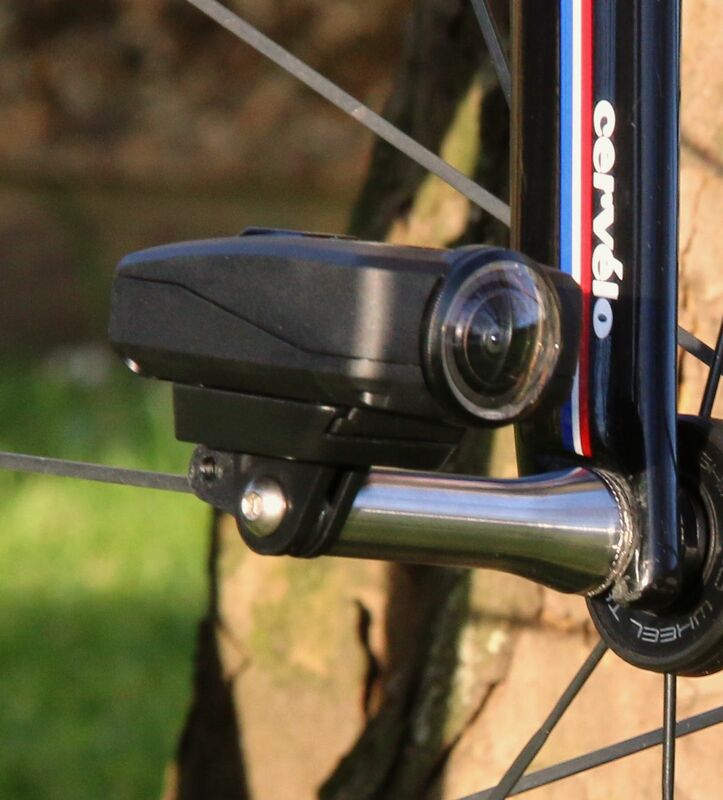 The positioning of a Camera on the front or rear Wheel Axle also benefits the quality of the footage compared to a Handlebar Mount as the radius of rotation around the rear axle is reduced by roughly 10% (based on a 54in Cervelo S5 frame). This directly affects the vibration amplitude which reduces by the same percentage. During out of saddle efforts where riders violently sway the handlebars side to side, the subsequent onboard Camera footage can be very "choppy", detracting from the viewer experience. Positioning the Camera close to the ground reduces the distance between the bikes point of rotation (the contact point between the tyres and the road) and the Camera reducing "chop". At NUT-R®, your safety is our highest priority. That is why so much effort and expense has been placed on qualifying and testing the Camera Mount and finding the most suitable material for use. You will be unlikely to find any similar products that have been as rigorously tested as this Mount. 2) Quick Release Mechanisms have become ever more effective over the years resulting in more force being applied to the Axle Nut's thread. 3) The NUT-R® Bicycle Axle Camera Mount™ is designed to be universally compatible with all bicycles with quick release axles. This means our design must accommodate the "worst case" in a number of scenarios. This means having a product strong enough to retain the most effective quick release mechanism, with minimum thread engagement whilst still having enough leftover capacity in case the Axle's thread is already worn. The Mount was designed by an in-house ImechE accredited Chartered Engineered and was qualified in Germany (to current ISO standards for mountain and racing bicycles) by a dedicated Bicycle Test House. Ensuring the quality of each supplied mount takes time and effort on our part but it gives you the piece of mind you expect from a professional supplier. We simply do not receive these mounts and supply them - the Mounts undergo visual and dimensional inspection, interface tests and thread pullout tests in-house to ensure the quality meets our requirements. With the vast emphasis on utilizing lightweight Aluminium Alloys and Composites within cycling technology you would be forgiven for believing that the use of Steel has no place in current bicycle technology. However, apart from Titanium Alloys being used in really high-end applications, Stainless Steel is the only material used for Axle Nuts due to its high thread capacity and proven reliability in corrosive environments (e.g. Road salt). Aluminium Alloys and Composites simply do not have the thread capacity or long term reliability to be used in this application. The other benefit of Stainless Steel is the high quality surface finish that can be obtained without secondary coating processes. The NUT-R® Bicycle Axle Camera Mount™ has an extremely high quality surface finish which will compliment any exotic machinery and never fade over time. The Mount's Body is CNC machined from solid Stainless Steel Bar (Cold Worked for Strength). The Spacer is manufactured in-house using our 3D Printer and ABS Plastic. The supplied Hex Screw is also made of Stainless Steel. 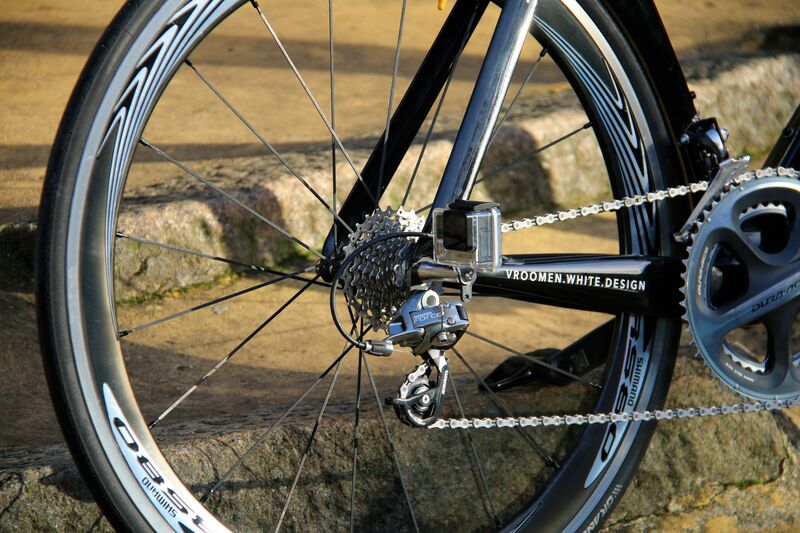 The NUT-R® Bicycle Axle Camera Mount can be very easily installed without the need for specialised tools. The Mount itself is no harder to install than a normal Skewer's Axle Nut and the Camera can be attached to the Mount with a 3mm Hex Key which is common place among Bicycle Multi-tools. 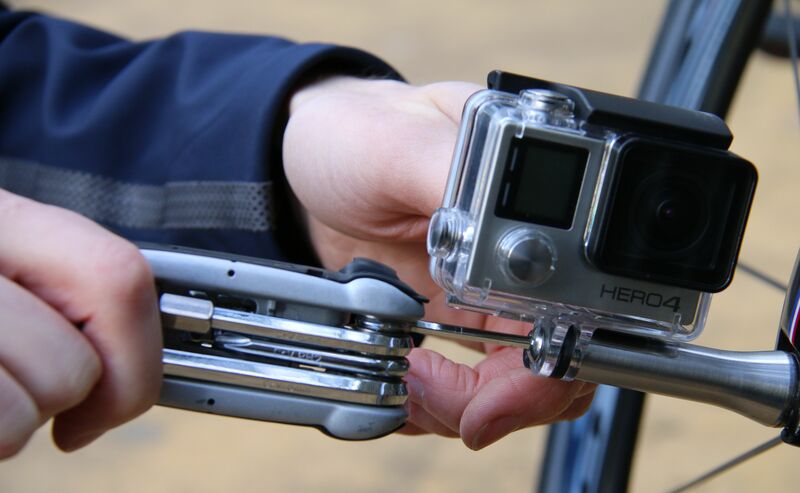 Listening to consumer feedback, the standard GoPro® Thumb Screw can also be used to attach the Camera to the Mount. This will, however, need a Spanner to ensure the Screw provides enough torque to retain the Camera. Assembling the Camera with Cycling Multi-tool. Assembling the Camera with a GoPro® Screw.